Ive spent some considerable time on here looking up information and going over things. However, I am uncertain which type of ring to get. Mild Steel? Galvanized Steel? Stainless Steel? And what option do I go with? Are these even the options I need to be looking at? I will probably never be using this for combat but I want to build it for that purpose. Why build a chainmail shirt that isn't usable in combat? Why different Measurements? Who knows. 16 oz in 1 lb. Stainless Steel *WILL* be expensive and heavy. Sadly, everyone will give you THEIR opinion... You need to dig through available data, and find out the answer for YOU. It depends on what your goal for the project is. Do you want your shirt to be period-authentic or do you want to use more modern materials to reduce maintenance? All of these materials will be approximately equally suited for combat although historical armor was practically always riveted. I have personally seen a sword cut clean through a piece of Vipera Berus Sheet made of 14g, 5/16" stainless so don't expect too much from butted rings. The reason there are so many different measurments is because some weaves require different ring sizes to work. you wont need 500 lbs to make a shirt, steel shirts weigh about 20 to 40lbs depending on the length and size. the 400 ring option is machine cut rings that are cut by a sharp toothless bade, they will most likely come slightly squished on one side like a 6 but not nearly as drastic, this is from the blade pressing on one side of the ring, you will want to level them into more of an O while weaving. the rings by the ounce are saw cut on a saw wheel, they are the highest quality but quite expensive because someone must be paid to run coils along the saw to make them. you wont need 500 lbs to make a shirt. oh I know that. The denotation is 500 rings per bag. Stainless is stronger but in terms of strength they will behave basically the same in every practical application. I think I'm going to go with the galvanized steel as it seems the best for cost to reward for me at the moment. Galvy can have a scent paticularly when wet. I would suggest trying a small pack of each material. Then starting with an avaintail or coif before tackling a full haulberk. ah, i was wondering why they were selling in 29 ounce quantity but then i figured it out with a trip over to the site. there have been more than a few people saying if they had it to do over again they would not use galvy, the zinc coating is a skin irritant, i have never used it but really idk why theringlord offers it for sale really. as for the quantities, if you go to the left hand menu there is KITS and a section called ARMOR KITS in the next menu. they come with rudimentary instructions and some bonze rings for a basic inlay. there are 14swg 3/8 kits, 16swg5/16 kits, scalemaille kits, all in the general quantities one would need. Welcome and well come. We all started somewhere. Many of us started smaller than a shirt. I did, and really, shirts and armor type pieces are all that I build and these are combat-intended at least in general -- I came at mailling through the Society for Creative Anachronism. Any of the above suit armor. The stainless is flashy as armor mail goes. Frankly, I say if you're building armor, hang out with the Anachronists and *use* it for armor. That goes especially for shirts in stainless -- rather a big investment, in a hefty and stout link, to just look pretty. Nothing wrong with pretty, but you can get more return on investment taking a more martial-arts path with it. In the SCA game, butted mail delivers particular value as a camail, about the neck and affixed to the helmet, where it makes an excellent protective curtain or drape, and also about the hips, for it is the simplest flexible, mobile coverage to use and it's very easy to have it look good first crack. In mail's use as armor, it should be expected to team it with padding beneath it, particularly as a shirt or coat. The SCA also mandates rigid protection overlaying and partway surrounding your kidneys, which rule they made early in their career when knights and nearly-knights started peeing interesting colors after tourneys. This protection is usually hidden under the mail. 14 gauge (SWG gauge) @ 3/8" ID is stout, frankly pretty coarse, and with that much diameter assembles fairly fast as mail goes. Finer wire and smaller links give a more genuine historical look to your mailshirt: this is what 16ga wire in 1/4" links will give you. Much closer to the genuine look, and a finer texture in the hand. Links like that are the finer sort of SCA butted mail links. Riveted can go skinnier yet, costs some to get pre-made, and takes four times as long to weave and more time to process and produce, starting from annealed mild steel wire. The skinnier wire cuts the weight of the shirt nearly in half -- usually we estimate 5/8 the weight of comparable sized 14ga links -- and gives about fifteen times the strength too. Requires a few more tools and a means of annealing -- well, the crude anneal of "normalization," which is good enough to go on -- your links at least once in the making. *There* you have serious armor, and links don't get bent up, open and fall out, hardly. There is very very little extra bother, and only three more tools needed, in buying just the plain wire and coiling and cutting those links yourself. I never do it any other way. The tools needed are a mini (or a small) bolt cutter, a metal mandrel rod (not a wood dowel), and some way to turn the mandrel such as an electric drill. Hand-turning methods are around; a power drill is faster -- a few have turned things perpendicular and used a drill press. Because they had one around already. As for "heavy," the difference is detectable, but modest. Gets to be less of a deal using slenderer wire, but you can definitely find the difference between 14ga shirts weighed on a bathroom scale. 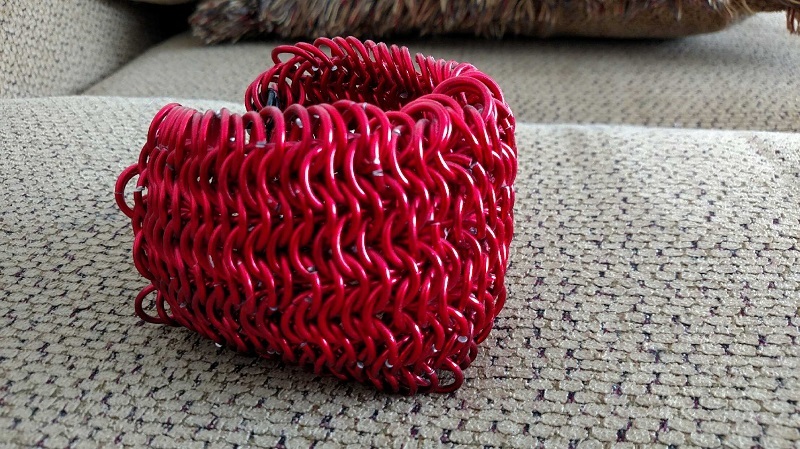 Coiling one's own rings may not be a "bother," but it does add considerable time to a project. I still coil my own rings sometimes but usually only if I need a specific size that's not easily available or if I need a variety of sizes from the same wire. I would still recommend it for a first-timer but not necessarily for a shirt. Then of course there are the finer points of coiling and cutting which should be fairly well understood before making one's own rings for a large project, including a preferred ring-handedness and a consistent score-and-break cutting method. if you go to the left hand menu there is KITS and a section called ARMOR KITS in the next menu. they come with rudimentary instructions and some bonze rings for a basic inlay. there are 14swg 3/8 kits, 16swg5/16 kits, scalemaille kits, all in the general quantities one would need. I wish I had noticed that before you mentioned it.... I purchased a 4800 ring bulk bag to start myself out on the project. I figure that will keep me for a bit and I can just buy more when I am through that. This keeps my "right now cost" reasonable. It may be a bit more expensive but I can spread it all out and get it done. 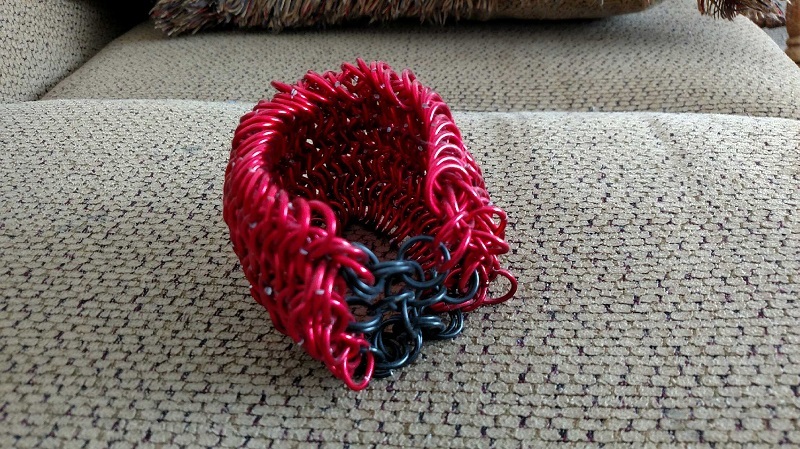 Its not the best and was done in incredibly soft metal so go easy on me lol. 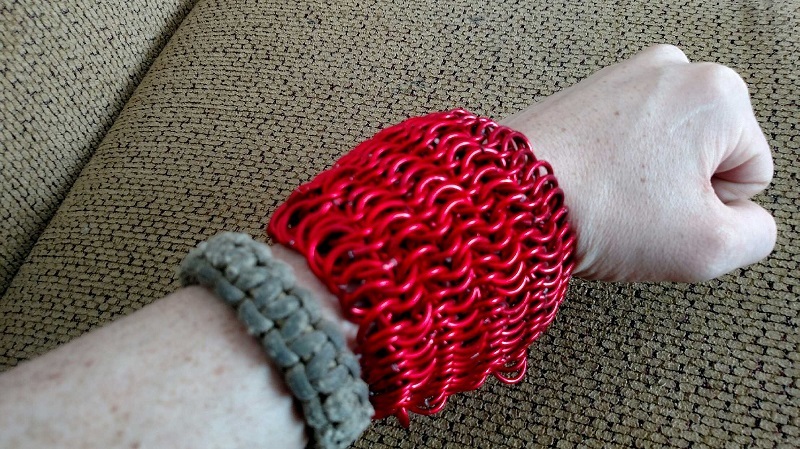 But as I was saying this project really made me love working chainmail so I don't think a big project will daunt me. Now that I finally have some time because I'm taking a semester off of college after going for almost 3 straight years I am going to get into this hobby. A lot of people underestimate the labor for larger projects. Coif or avaintail is a lot less material cost/labor that a full haulberk. Your ahead of the game having some experiance and a decent and that's the idea. Time/material costs can be a little gauge until you actually start putting in time. I find it helpful to do most of the rough construction in sub assemblies or strips or pannels. 4-6" wide is a bit more manageable, but it depends on what your comfortable with. Cutting your own rings is a lot more labor but saves you a little in cash. I use knipex cobolts now, but started with wiss M5'a or m7's. The wiss brand ended up snapping somewhere bette 1/2 to 1 mile using 14 gauge galvy 3/8" rings. Most of the other metal options are more costume or decorative when it comes to armour.